Famous Pakistani Ghazal Singer Mehdi Hassan has passed away at age of 84 in Karachi on Wednesday morning leaving his millions of fans in Pakistan and across the border sad. 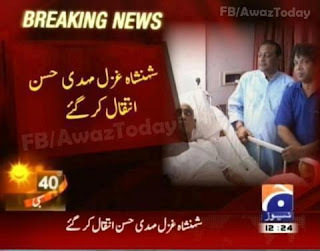 Mehdi Hassan was ill from a long time and from last few days he was admitted in a private hospital of Karachi. Mehdi Hassan was born in Rajasthan in 1927 and in 1947 during partition his family came to Pakistan. Mehdi Hassan left singing in 1999 due to illness. Pakistani as well as Indian Leadership and public are showing their sorrow on death of Mehdi Hassan Sahab.